Most tropical plants will not survive our freezing outdoor winter temperatures in Connecticut, but they sure are fun to grow from summer to fall. Because I’ve introduced many tropical plants to clients and gardening friends, I decided to offer my first class on how to overwinter the big three: Canna, Colocasia (Elephant Ears), and Musa (Banana) plants. It was held last weekend on October 13th, right after our first early frost the evening prior. I shared a brief overview of the tropics with the attendees so they could get to know where these plants come from. By learning about their natural habitat, and gaining insight on how they grow and react to environmental conditions, one can connect the dots on how we treat them here in our planting zones as we prepare to overwinter them as dormant plants. We discussed how tropicals experience winterless climates and have basically one season. We also discussed characteristics, such as short-day plants, frost sensitivity, wide diversity, types of soils, and climate happenings in the tropics. Everything from their tropical rainy to monsoon climates were considered. To me, this paints the picture of who they are and more about their true home as they vacation at our homes during the summer months. We looked over a diagram of banana plant parts also. One banana plant in particular, called Musa ‘Basjoo’, can actually be overwintered in the ground here in CT as long as you provide the correct protection around the base of the plant right after frost. The diagram depicted how the plants grows as a mother plant, and a daughter plant arises next to it. The rhizome, roots, and banana blossom and flower components were discussed. Some off-shoots or suckers of banana plants are also called “pups.” If banana plants receive enough months of the appropriate warm temperatures and sunlight, they will produce a flower bud and bananas. 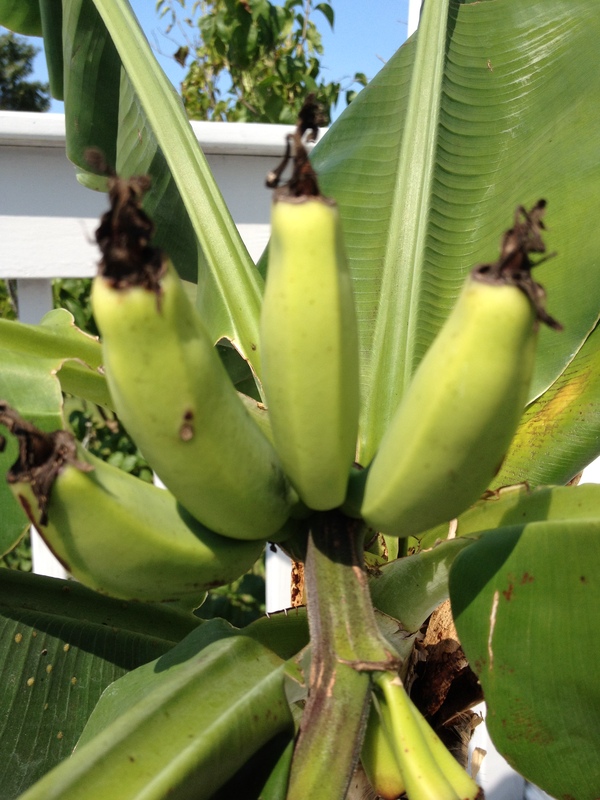 My sister-in-law’s banana plant bloomed and produced fruit this year, but it was not a Musa ‘Basjoo; it was another variety I gave her the previous summer season, called Musa ‘Dwarf Cavendish’. It fruits at 5-7′ provided it gets enough warmth and light for at least nine months. She kept it indoors as a houseplant last winter, and transitioned it outdoors this year in early summer. It received eleven months of non-stop warmth and sunlight to grow, and a eventually a plum colored flower bud appeared. The bud grew to the size of small football, and then the flowers began to form leading to the banana fruit. This surprised her whole family. At first they didn’t know what the bud was. They observed how the banana fuits grew from it, and are still hanging on her plant today. So far, they haven’t tasted any of them. I think they are scared to try. And now her mother plant is setting off many more pups. After sharing this amusing story, and the components of the banana plant’s flower and fruit, we headed outside to chop down a Musa ‘Basjoo’ in my landscape so everyone could see how it is done. Also I wanted to share how tall the plants grew in one season. This plant was planted in the early summer of 2011, and did “not” receive the protection steps last winter because of our freak October snowstorm. I ran out of time. However, we had a very mild winter last year, and the mother plant returned, and a daughter plant right next to it grew as well. Both reaching seven feet tall this season. Musa ‘Basjoo’ can grow to 15 feet in ideal conditions per the growers’ references. It is hardy in Zones 6-11 and can take full sun, or part sun to part shade. 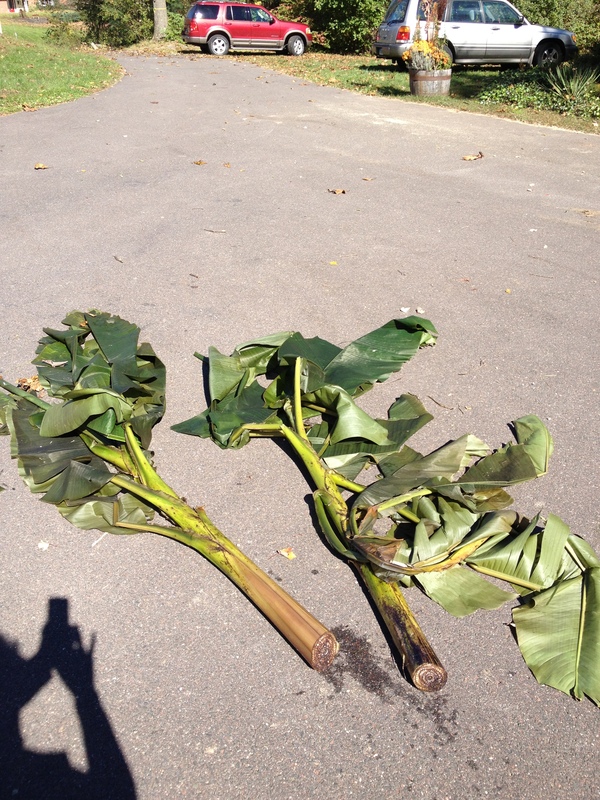 To see the quick video of taking down my Musa ‘Basjoo’ banana plant, go to my VIDEO GALLERY page on this blog, or click here: https://cathytesta.wordpress.com/videos/. Musa ‘Basjoo’, common name: Japanese Fiber Banana, can survive in the ground if protected appropriately in the fall season with layers of mulching materials. Before you protect the base of the plant consisting of the pseudostem, rhizome and roots, you must do some easy lumberjack work after the foliage have been hit by frost and collapse. I say easy because the trunk of this plant is fleshy and moist, so it doesn’t get hard like it would on an actual tree. It not a trunk either, it is called a pseudostem made up of overlapping leaf sheaths. I used a bow-saw to cut it about six inches from the base, and down it went. As I said, “Timber!”, everyone in class laughed. Because the soil on the north side where these Musa plants were growing is more organic, maintains good soil moisture, and is somewhat protected by overgrown English Ivy (to be removed this year), it faired better than the ‘Basjoo’ banana plants in a small bed on west side, where the soil stayed dry, unless I watered it. Banana plants like alot of water and rich soil to grow well, so the north side was the perfect conditions. The house provided some shelter from the wind so that was also a bonus. 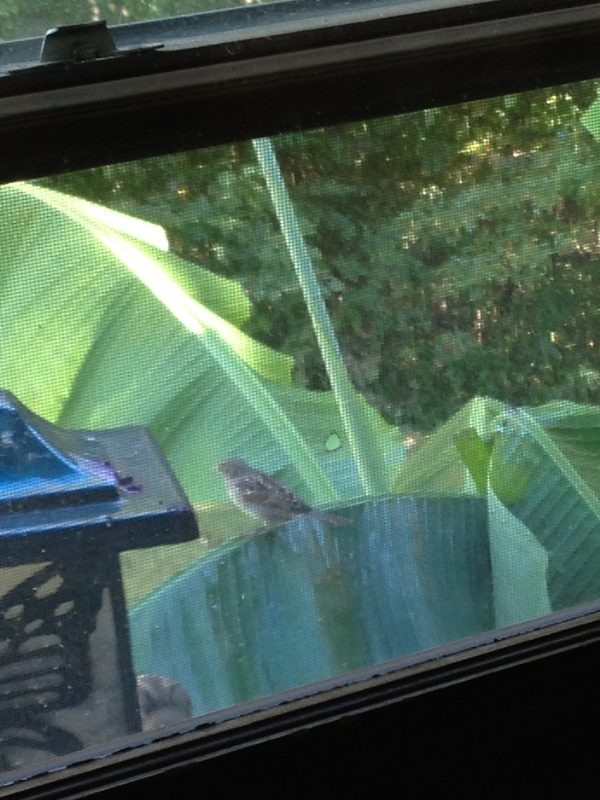 Leaves did not tear and served as a perch for birds visiting a bird feeder nearby. I was sorry to see it go. But the good news is it will return next season. After we took down Musa ‘Basjoo’, we headed over to our class stations to learn how to dissemble Canna, Elephant Ear, and some other tropical plants from container gardens. Attendees also brought along plants they could easily transport to learn how to treat each for winter survival. It was the perfect day, bright sun and chilly air, with the frost occurring on queue, the evening before. Class went well, and I plan to hold it again next autumn. Attendees got the confidence they needed to do this process on their own. Having a hands-on opportunity allows them to see the tools I like best for this process, and it also provides me with insight on the types of questions they have.